This spring I spent two months in Italy, and the experience gave me a new appreciation for fluency. Fluency allows one to make specific statements or ask particular questions, to select from a range of options, to take social and historical precedent into consideration while meeting the demands of the moment. It allows for the explicit and the implicit, the broadest aspect of words, intonation, inflection, gesture, and posture. Practical use suddenly finds opportunity for poetic expression, and things left unsaid become as meaningful as those which are spoken. Most of this was lost to me, because I’m nowhere close to being fluent in Italian. Hence the new appreciation. Although my artistic practice has become quite inclusive, I center myself in the act of painting. This is where I feel fluent. Just as with other languages, fluency in painting comes from an accumulated wealth of experience and application. That is, one experiences and understands the communication of others, and by way of that experience one is able to engage with and build upon the existing language. Fluency is not static. Near the end of my visit I found my way into the Cenacolo di Sant’Apollonia, where I saw an extraordinary painting by Neri di Bicci, Madonna and Child Enthroned with Saints. At first glance, the presentation of the subject is so familiar that it is easily dismissed. I passed the painting on my way into the main hall of the museum without giving it much thought or scrutiny. As I was preparing to leave the museum, though, I glanced at the painting once more and it stopped me in my tracks. What was this? A mother reaching awkwardly to arrest a child’s arm, to retrieve the groping hand already well on its way inside her garment? Most of us are familiar with images of the Christ child in repose, at play, or in full suckle, but this presents itself as something both strange and special. It is an eloquent expression of desire, of love, and of discomfort. The painting succeeds in creating a sense of humanity which is tangible and convincing. And that sort of eloquence is not born of painting. It emerges from a keen recognition of events in the world and the imagination of how lesser events might otherwise be transformed in the retelling. This, too, is a form of fluency. 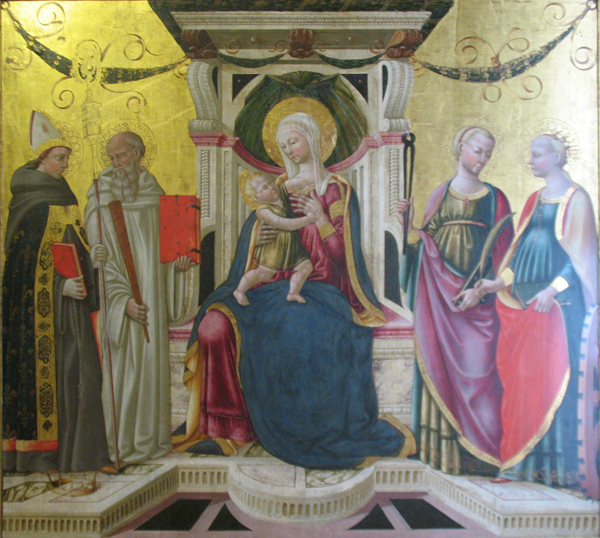 This entry was posted in painting and tagged Cenacolo di Sant'Apollonia, fluency, Italy, Madonna and Child Enthroned with Saints, Nerri di Bicci, painting on May 27, 2009 by johnsarra.